we had to drop off Mr. Pawlish's computer today for servicing, it seems he's got loads of malware on it :( luckily, the place we took it to was next to Marshalls because i had to exchange one of the Orly polishes because it had a defective cap. it was one of the ones that won't stop spinning... i worry that those aren't sealed enough and the polish itself will dry out! so, i swapped that one out for the same color and found another of the Mineral Fx collection... that makes it so i'm only missing one :D i also grabbed another Orly from there... having the polish next to registers makes me impulse buy! we also headed to Ulta, i was hoping they'd have Zoya's Holiday collection, but no such luck. they did have some cool looking Essence polishes... and for .99 cents i figured, why not? i'm super happy because i found out they carry Badger Balm, that stuff is awesome! 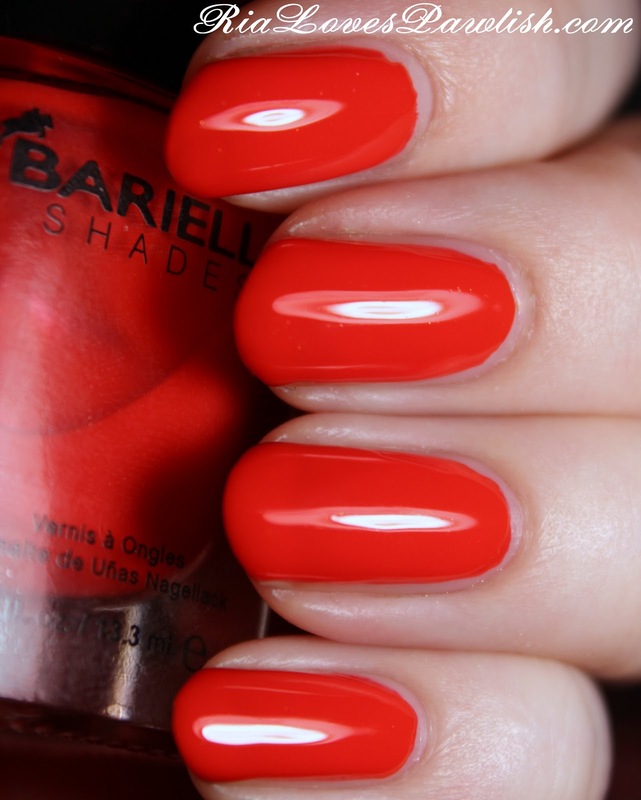 today polish is one i bought yesterday, Barielle Suntini! it's a bright, super saturated orange red creme... although on me, it looks more like a red orange. i can never accept that colors i want to be orange always read more red on me! while the color is very intense, the formula is a bit thin, so that even at three coats there is a bit of visible nail line. although, this color is so bright and fun i can excuse a little VNL! it dries really glossy on its own, but i did add topcoat to seal it off. three coats Suntini, one coat Seche Vite. i found this and lots of other Barielle polishes at Marshalls for $2.99, you can also buy it direct from Barielle on their website for $8!